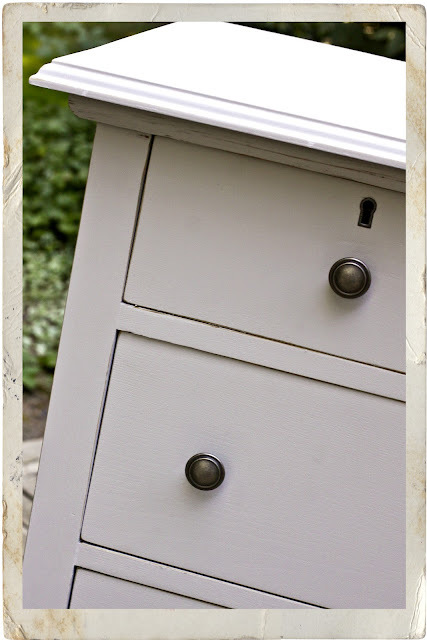 there is a lovely old wooden dresser that has been knocking around our family for quite a few years. from what my mom can remember, it was left behind in a college apartment and given to my dad by the landlord when he was a student. i remember it in our house when i was little and it was a serious, dark wood stain. then it became my sister's and somewhere during her tween years my mom tried to win her over with a bedroom makeover that included the lovely shades of bright blue and lime green you see here. during my sister's angsty teen years, i think the poor dresser ended up in a closet. then a abandoned in a spare room for years, now it's mine and it's time for a makeover. 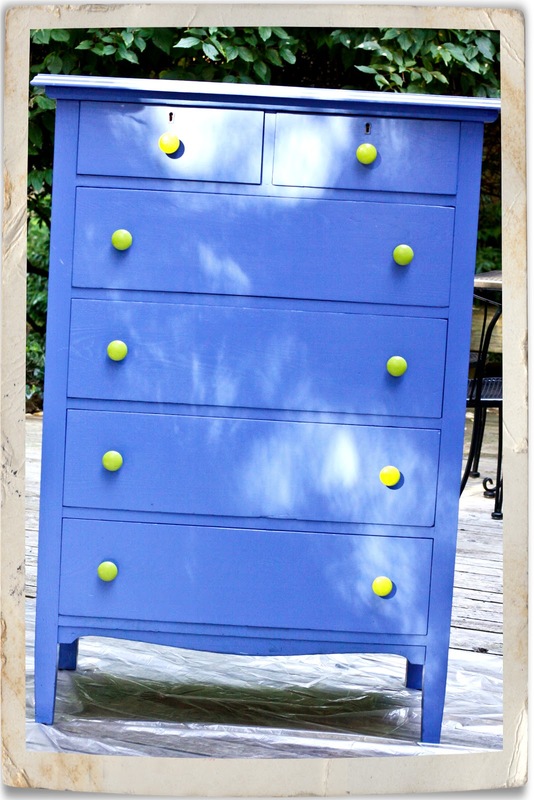 well actually for now it's my husband's dresser so we had to compromise on a few things like paint color but at least we agreed the blue & lime green combo had to go! 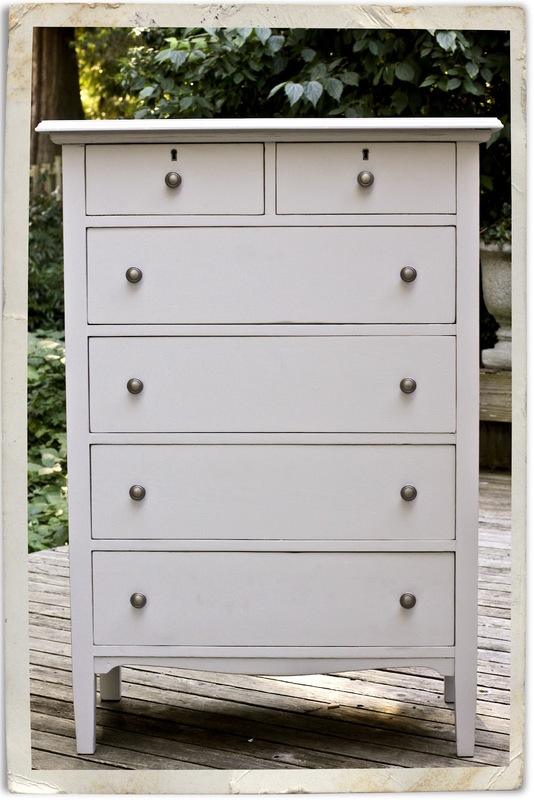 so after more than a few hours of stripping, sanding (oh the sanding,) and painting here is the dresser in it's beautiful new color, silver sateen. complete with new drawer pulls and matching keyholes (thanks to shaun's ability to mix & match metal paint colors), i'm kinda in love. i would have done a bit more distressing but since i was compromising, i gave the edges just a light sanding. one last summer project crossed off the list! wow! it looks amazing... so chic (& manly). it's GORGEOUS and i LOVE it and i want to steal it from you.... i suppose it's a good thing i'm 2000 miles away now?! seriously, that's an amazing transformation. i didn't even notice the keyholes when it was blue and lime green but before i even read your words about the keyholes, i noticed them in the "AFTER" photo. WOW. It looks gorgeous! Can't believe the transformation! Are you two available for hire? Upon scrolling down I was relieved to find that WASN'T the case, and I love the silver sateen dresser! You have such great taste, Carly!